Nir Avieli’s ethnography is a timely and necessary foray into the explorations and intersections of politics and food. Avieli draws on his extensive semi-auto-ethnographic fieldwork in Israel to highlight the intricate and complex relationships between food and national identity, particularly in light of Israel’s deeply contentious relationships with both the Palestinians and with its Arab neighbors. Throughout his ethnography, Avieli interweaves his experiences serving in the Israeli army and his personal life in Israel with his ethnography to discuss the power structures in Israel as they pertain to food preparation and consumption (page 14). Specifically, Avieli claims that power derives from imbalances in a variety of resources, such as legitimacy, prestige, violence, and access to economic resources (pg. 8). As an example, Avieli discusses the 2006-2009 Hummus Wars between Israel and Lebanon to illustrate the national prides at stake in claiming ownership of hummus (pg. 6), which stands as a unifying cuisine. Israelis and Lebanese competed over creating the biggest dish of hummus to break the Guinness World Records. Avieli structures his book around several vignettes showcasing the multilayered relationships between power and food in Israel. In doing so, Avieli interlaces these vignettes with his personal experiences In Chapter 2 (‘Roasting Meat’), Avieli provides an in-depth analysis of barbecues and other meat-grilling activities on Israeli Independence Day (generally held in May). Avieli focuses on the celebrations held at Sacher Park (a popular park in Jerusalem), discussing how the barbecues are ambivalent events in which potency and power are inseparately mixed with feebleness and victimization due to the differences between the types of meat used for barbecues (page 78). Specifically, men get the superior meat (beef) while women receive the inferior meat (chicken [pargiot]) because meat is more muscular and bloodier, while chicken meat is softer and more vulnerable (page 67). In addition to the type of meat typically consumed, Avieli outlines the organization and negotiation of space in Sacher Park, particularly as it pertains to food preparation. Competition is fierce for space in Sacher Park, particularly for limited shade, access to the northern part of the park, which is closest to parking, and proximity to water, as water fountains are scarce in the park. Barbecues in Sacher Park also clearly delineate the Israeli concept of Levad Beyahad (‘alone together’), or the blurring of boundaries between private and public space, which helps individuals deal with the social and structural superiority of the collective in Israel: people are together with other Israelis in superficially large numbers, but families still clearly demarcate personal space. This principle reflects relationships among Israeli Jews, exposing the tension between the desire to be a part of the collective on the most important national day of the year, and the constant efforts of the participants to demarcate boundaries between themselves and others (pages 73, 78). On a broader geopolitical scale, the struggle for space between Jews and Palestinians is also reenacted on a day that celebrates Israel’s victory over the Palestinians and reflects the relationship between Jews and Arabs in the shared space they occupy and serves to explain the practice of spot grabbing. These struggles encompass many of the most pressing issues and dilemmas of contemporary Israel. In Chapter 3 (‘Why We Like Italian Food’), Avieli emphasizes the role of homesickness and yearning: immigrant homesickness for their home cuisine, and Israeli yearning for American things, which denote modernity, sophistication, and cosmopolitanism (page 86). This desire for high ideals is based in Israeli pizzeria owners’ experience working in the United States, as well as Israeli modification of traditional Italian dishes, since the majority of Italian dishes are imported by Israelis, not by Italians, who comprise a tiny portion of Israel. Italian restaurants are successful in Israel for at least two major reasons: unlike, for example, French food, Italian food lends itself easily to kashrut laws, which forbid the mixture of meat and dairy (many Italian meals can stand as either dairy or meat). Additionally, Italian restaurants tend to be family-friendly, which appeals to the family-central ethic of Israelis and to food preferences of Israelis, adults and children alike. Israelis like Italian food because the similar weather and ecological conditions in the two countries make for similar ingredients, cooking styles, and taste preferences – similar ecologies between Israel and Italy have resulted in social, culture, and psychological affinities between Israelis and Italians, also known as Yam-Tichoniut (Mediterranean-ness). The national character and habitus of Italians, especially southern Italians, is similar to those of Israelis, particularly hyperactivity, preference for simple food, and a lack of desire to wait long times for food to cook. Given the length of time it takes to prepare pizzas, pizzerias have become places for families to hang out and socialize, unlike the ubiquitous falafel stands, which discourage lingering due to the in-and-out nature of these stands (page 95). Additionally, Italian food allows Israeli Jews to construct an alternative spatial and cultural imagination of Israel, one that is associated with the Southern European-Mediterranean region rather than the Arab Middle East. Israelis consider themselves along the coast of southern Italy, as an escape from the Middle East. Italy isn’t connected to the Diaspora or the Holocaust and it doesn’t stand for the iconic West (NW Europe and North America), where the largest Jewish and Israeli Jewish diasporas are now located (page 101). Avieli situates the Israeli passion for pizzerias in the Ashkenazi Jewish[i] desire to remove the Oriental stigma attached to them by non-Jewish Westerners, by adopting Western-style foods and developing a Western nation-state, especially in the peripheries of Israeli dining outside of major culinary hubs like Tel-Aviv and Herziliya (pages 106-107). In doing so, Israel affirms its Western nation-state status by relegating social segments of the population, such as North African and Mizrahi Jews, into the periphery and relegating their foods to the exotic Other. Chapter 4 (“The McDonaldization of the Kibbutz Dining Room”) highlights the transformation of kibbutzim in Israel from a paragon of Israeli socialism into a concerted effort to adopt Western capitalism. The kibbutz is the social heart of Israel, so the McDonaldization of kibbutz culinary practices from table service to self-service is seen as a reflection of changes in Israeli food service as a whole (pages 112-113). In this chapter, Avieli argues that the biggest competitor for kibbutz members’ loyalty is the social institution, such as extended family and ethnic groups, as well as newly reestablished socioeconomic classes and allegiances (page 116). The kibbutz dining room operated as hubs of commensality and food sharing: breaking bread and eating together were important venues of group consolidation and solidarity, even as such acts also reaffirmed social norms and demarcated the people who weren’t included (page 117). By breaking up individual family units (adults sat with adults and children sat with children), the dining room stripped self-identity and reassembled identities as parts of a collective new whole: the Israeli identity (page 118). In turn, kibbutz members felt that other kibbutz members presented as an alternative family whose members were all siblings (page 123). However, as kibbutzim grew larger, budgets and food sources remained low, and there was little regulation of kibbutz members who took more food with little regard for other members, the transition to self-service and privatization became increasingly necessary. By the end of 2010, 193 out of 264 kibbutzim in Israel were privatized (page 128). Kibbutz members also considered the introduction of self-service to fall under McDonaldization ideology, as people could choose whatever food they want and sit wherever they want, a process which also saves long queues and work times and represents an ideological shift from the collective to the individual (page 143). Kibbutz scholars unanimously argue that the kibbutz crisis and the ensuing shift to privatization is very much a consequence of the shift from collective ideology to individualistic tendencies (page 132). The family remained a threat for kibbutz members’ allegiance: families couldn’t originally cook in their units because there were no kitchens, so everyone was required to eat in the dining rooms. However, with the institutionalization of the kibbutz, the family gradually reemerged, along with the urge for family meals (page 133). Along with the spatial and financial consequences of privatization, Avieli also details the culinary ebbs and flows of the kibbutz dining room. Food was structurally and materially Ashkenazi: the main lunchtime meal consisted of starts, soup, a main course (meat, cooked vegetables, and carbs) along with desserts and beverages. The ingredients used in food preparation consisted of schnitzel (fried and breaded chicken), meat stews, baked or mashed potatoes, pasta, and steamed rice with mild seasonings. This process underscores the tensions between Ashkenazi and Mizrahi Jews in Israel, including the Otherization of Mizrahi cuisine. Even though Ashkenazi Jews are not the majority in Israel, Ashkenazi fare is still termed “Jewish food”, while non-Ashkenazi food is usually given national labels, such as Moroccan, Iraqi, Kurdish, or Persian, but not Jewish. This terminology demonstrates the Ashkenazi claim for exclusivity over Judaism and the dismissive attitude Ashkenazi Israelis exhibit toward non-Ashkenazis (page 221). In Chapter 5 (“Meat and Masculinity in a Military Prison”), Avieli traces the complex interactions and expressions of masculinity between Israeli soldiers, Israeli military police (MP), and Palestinian prisoners at the Megiddo military prison. Tensions between the three groups draws on the overall logic of the occupation, particularly the cognitive and the emotional processes that allow Israeli Jews to reinterpret and redefine their relations with Palestinians so as to maintain a sense of weakness and victimization (page 146). Despite the common-sense expectation that the armed IDF soldiers guarding the prison would feel empowered and in total control, they considered themselves victims of the situation and of the detainees. The Israeli soldiers assigned to guard the prison frequently complained about the substandard fare they were provided, stating that they were given reheated chicken and limp vegetables while the prisoners and MPs were given better food. Soldiers compared their meat rations to rations of prisoners and military police (MP), and to what they used to get at home (page 148), in the process hinting that they felt more masculine as civilians than as soldiers. This comparison draws on the hegemonic interpretation of masculinity (e.g. authority, physical strength), which Avieli hearkens back to the days of hunter-gatherers, when prowess in hunting and the enjoyment of meat that a successful hunt allowed, led to increased chances of survival (page 152). It is important to note that soldiers at Megiddo prison weren’t suffering from lack of food: they have 3 meals per day, including meat, fruits and veggies, dairy, eggs, bread, and a cooked starch. The food was plain and not very fresh, but there was enough of it (page 162). The competitiveness over food quality is rooted partly to frustrations about instructions they received about opening fire on prisoners. Contrary to standard military procedure, at Megiddo prison, if prisoners attempted to escape, soldiers were to lock themselves in their towers and only use guns if prisoners tried to break in – otherwise, let them run away. The administration’s reasoning was that if soldiers shot prisoners, it would look bad for the prisoner and for Israel in general, which they couldn’t afford to let happen (page 161). Soldiers took this unusual policy amiss, understanding that the Israeli military saw their welfare as less important than that of either the prisoners or of the military’s international image, which enhanced the soldiers’ sense of victimization. Soldiers also complained that prisoners received better food than they did and were allowed a greater sense of autonomy, especially with assigned tasks and day-to-day leadership (shawish/sergeant system, which the Palestinians elected and ran themselves), and with prisoners cooking and cleaning for themselves (page 158). Comparatively, soldiers often received soggy, semi-frozen schnitzels and scorched stews; the bad food has occasionally led soldiers to mutiny, arguing that they needed more meat in order to have the energy to serve (pages 165-166). The prisoners and MPs also saw themselves as victims. Palestinians saw themselves as victims of Jews and the State of Israel, and Zionism a belated form of European colonialism. The MPs felt victimized due to their very postings: in the Israeli military, being part of the military police is considered a shameful appointment because they need to police their own comrades instead of fighting the enemy (page 169). Despite Israel’s significant social, economic, and scientific achievements and its proven military might, Israeli Jews cultivate a self-image of the eternal victim. In the masculine setting of the military prison, the transformation of armed soldiers, the epitome of hegemonic masculinity, into self-perceived victims of their own prisoners was neither simple nor straightforward (page 175). Israeli Jewish soldiers felt that they were the real and only victims of the situation; even though the State of Israel and the IDF had devised and structured the institution that was victimizing them, they felt both victimized and justified in their actions (page 176). Food bridges the gap between the theory and praxis of nationalism: food and eating were important topics within the reserve soldiers’ narrative of victimization due to the food not being fresh and the dining room staff doing their job poorly by failing to ensure that soldiers had better food (page 177). Chapter 8 (“Thai Migrant Workers and the Dog-Eating Myth”) draws on Israeli misconceptions of Thai migrant workers’ eating habits to highlight broader social ambivalence towards Thai migrants. Thai migrants make up the bulk of the agricultural workforce in Israel, and rumors abound about Thai migrants hunting and eating Israelis’ pet dogs. This is an Israeli myth in order to define Thai workers as subhuman, therein justifying their economic exploitation as cheap labor and solving any ethical quandaries arising from said exploitation (page 187). However, Thai migrant workers did occasionally kill their employers’ chickens (sometimes with their bare hands) in order to obtain fresh meat. Meat is relatively expensive, and migrant workers oftentimes had neither the income nor the transportation to go to a market on a regular basis (page 194). Israelis view hunting negatively, particularly as fresh game is harder to kill according to kashrut laws; instead, Israelis prefer to purchase meat. Furthermore, Israeli animal farmers tend to distance themselves from the act of killing, which is done elsewhere and by other people, so they considered themselves life givers rather than life takers. By killing chickens with their hands, often in sight of their employers, the Thai workers were demolishing the symbolic barriers that protected their employers from facing the violent death they were inflicting on the millions of animals they farmed (page 196). More broadly, Avieli draws on Aziza Khazzoom (2003) to emphasize Zionism as a modernizing, Westernizing experience during which early incarnations of the Jewish Diaspora were stigmatized by their successors for being Othered and Orientalized (page 210). Yitzhak Rabin’s government’s decision to import migrant workers breached some of the fundamental values of Socialist Zionism that practitioners professed to champion, particularly social justice and an egalitarian ethos. Instead, Israelis employed aggressive Orientalizing and stereotyping techniques to deal with the moral dilemmas instigated by the hard employment of migrant workers (page 211). In the same vein, Israelis portray Romanian immigrants as poor drunkards, Filipina immigrants as gentle and submissive, and West African immigrants as dangerous, masculine, and intellectually limited (page 212). However, Thai immigrants didn’t fit these easy molds because Thailand remains a popular Israeli vacation destination and because Thai immigrants work in the agricultural sector, which Israeli Zionism highly values as the epitome of strength and self-reliance (pages 212-213). As such, the association of Thai migrants with the hunting and consumption of dogs allows Israelis to both exploit the fruit of Thai migrants’ labor and to enjoy Thailand as an exotic vacation without any sense of guilt. Several questions yet remain after Avieli’s extensive ethnography. For example, are barbecues interpreted differently on normal days than they are on Israeli Independent Day, a holiday ostensibly dedicated to an Israeli show of victory over not only British colonizers from the 1948 War of Independence, but also current-day Palestinians for whom Israeli Independence Day is a reminder of colonial rule (pages 54-55). Furthermore, Avieli never made it quite clear why he chose Sacher Park as a field site if, as he claims on pages 55-56, the park doesn’t fully represent independence-day celebrations. Additionally, while Avieli discusses several very salient points regarding food preparation and consumption as representations of elite power, he does not provide any ways in which those without power can use food to gain power on their own terms, or at least to claim culinary legitimacy. These expressions of identity through food are important cultural actions, as Avieli himself showed during his commentary on the Hummus War between Israel and Lebanon. 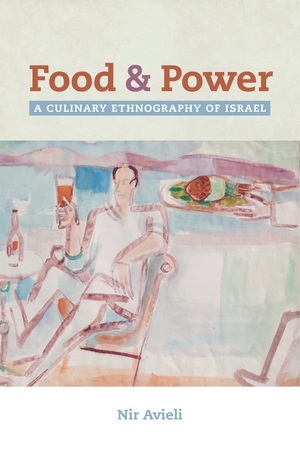 Ultimately, Nir Avieli analyzes several comprehensive vignettes showcasing that food is a means of exercising power in Israel. Avieli uses these vignettes to juxtapose idealized Israeli qualities with current practices. For example, by discussing Israeli soldiers’ consistent complaints regarding their fare in comparison to the Palestinian prisoners, Avieli draws out the contradictions between Israel as a superpower in the Middle East with the eternal Jewish self-image as “absolute victims” (page 227). Additionally, the Israeli association of red meat with bloody masculinity despite the distaste with which Israelis view hunting and blood consumption, indicates a disparity between desired qualities of idealized masculinity and actual cultural practices. The cultural elite’s foodways are de facto the assumed culinary pathways for the entire population, regardless of alternative cuisines and practices (page 225). Mizrahi cuisine is an Israeli creation, a way of Otherizing Mizrahi Jews who otherwise enjoy a wide variety of foods not limited to the Israeli perception of Mizrahi cuisine as merely spicy and overdone (page 221). In this way do minority cuisines become limited to stereotypes in the face of the elite’s culinary preferences and perceptions of other groups. [i] Ashkenazi Jews are Jews of German and/or Austrian descent. Mizrahi Jews are Jews of Iraqi, Iranian, Kurdish, and/or Syrian descent. Editor’s note: SAFN is a section of the American Anthropological Association. The AAA is currently holding a vote on a resolution to boycott Israeli academic institutions. There has been a great deal of useful debate around the issue, some of which you can read about here. Although SAFN has not taken a position on the resolution, we welcome commentaries from anthropologists that do advocate positions on the resolution (from any perspective). In keeping with the mission of this blog, commentaries related to the resolution should have some relationship to the anthropology of food and nutrition. The election that includes the resolution closes on May 31, 2016. Please send commentaries for the blog to dberiss@gmail.com. As the recently departed and much mourned anthropologist Sidney Mintz argued so persuasively, food links the quotidian needs of humans, inflected by their culturally inculcated memories, desires, and emotions, to wider global political economies that often include exploitation and oppression. In my study of extra-virgin olive oil, I was inspired, as so many of us food anthropologists were, by Mintz’ classic work on sugar, especially his emphasis on the need to understand different moments in a food commodity’s life: in the political economies of production, consumption and circulation. I began work on Palestinian olive oil a decade ago. Even if I had not been trained, as most of my generation was, to critique an anthropology that ignored the overarching structures of colonialism, there was no way to ignore the shocking impact of the Israeli occupation of the West Bank. My work on olive oil production required that I witness firsthand the effects of land confiscations, settler violence, the fragmenting effects of checkpoints on people’s time and social ties, and the destruction of their beloved olive trees along with their livelihoods. An Oxfam report noted that the Israeli blockade of Gaza which so strangles the import of food, also blocks the export of olives and olive oil, so essential to Palestinian diet and culture, from the West Bank to Gaza. I was asked by Palestinian activists, olive oil professionals, and academic colleagues, to participate in boycott activities, from consumer to academic, in an attempt to address the injustices of the Israeli occupation of the West Bank; it is the very least I can do to reciprocate for the help they have given to me in my research. Most of you have not had the opportunity to do the kind of research that I have done. Nonetheless, I hope many of you will join me in voting “yes” to our AAA boycott vote, as part of an ethical stance that we can take as anthropologists to address a grave injustice in our world. Lara El-Jazairi. The Road to Olive Farming: Challenges to developing the economy of olive oil in the West Bank. Oxfam International October 2010. The terms “Desert” and “Food” seem irreconcilable: deserts are associated with aridity, scarcity, and the struggle to survive in inhospitable environments, and are rarely related to the pleasures of fine cooking and dining. Research of desert societies, however, reveals time and again the ingenuity and resourcefulness of desert dwellers, who manage to eke out of their meager environment much more than the calories and nutrients essential for their survival. Indeed, desert cuisines, whether Mexican, Native-American, Bedouin, Mongolian, Aboriginal-Australian or Inuit, may seem simple and even coarse to the uninitiated, yet are surprisingly complex and varied, making for an outstanding human achievement. If desert foods represent human ingenuity at its best, food deserts, defined as disadvantaged urban areas with poor access to retail food outlets, or as areas where food retail is scarce and expensive and where much of the available food is industrialized, processed, expensive and of low nutritional quality, stand for the degradation of the human condition in the context of modern urbanism. The distinction between “desert foods” and “food deserts” is not without ambiguity. Processes of modernization undergone by some groups living in desert areas have indeed undermined local and traditional culinary practices and hastened the expansion of fast-food chains into those areas. However, at the same time, a counter-reaction to this process has brought about creative and innovative ideas and practices which seek to produce and distribute quality food in a non-alienated environment. Examples of this include community vegetable gardens, farmers’ markets and social networks for the exchange of knowledge and information regarding the cultivation and procurement of fresh food products. Beer Sheva is the perfect venue for hosting such conference. Israel’s “Capital of the Desert” is located at the heart of the Negev Desert and constitutes the administrative, commercial, and cultural center of the surrounding desert communities. The city draws Bedouin semi-nomad shepherds and town dwellers, Jewish farmers in communal and private agricultural settlements, as well as large numbers of migrant workers from different countries, and serves as their culinary centre. Up until recently, Beer Sheva was a typical “food desert”, featuring mainly cheap local fast-food venues as well as small and medium size grocery shops (“minimarkets”). Rising income, the influx of immigrants from the former USSR, the expansion of Ben-Gurion University and the growing communities of migrant workers from Africa and Asia, have led to new and diverse culinary demands. Beer Sheva is now an exciting hub of culinary experimentation and innovation, influenced by its multicultural and multiethnic social mosaic. The conference seeks to unravel and discuss the rich and diverse culinary concepts and practices in both actual deserts and symbolic ones. To that end it will provide a platform to both scholars and practitioners. Keynote speakers at the conference will be: Prof. Sammy Zubaida, Chef Israel Aharoni. We seek sessions and individual papers that deal with various aspects of desert foods, food deserts, and possibly their interface. “Deserts” are understood in the broadest possible sense of the term and include any region, territory or era where food is/was scarce and hard to get. As the conference will also include a non-academic session with the participation of culinary practitioners from various fields proposals are also welcome for that session. The conference is hosted by the Department of Sociology and Anthropology at Ben-Gurion University of the Negev in cooperation with the Israeli Association for Culinary Culture, and is supported by The Hertzog Center for Middle East Studies and Diplomacy. The Conference conveners are Dr. Nir Avieli avieli@bgu.ac.il, Dr. Nimrod Amzalak info@culinaria.org.il, Prof. Aref Abu-Rabiah aref@bgu.ac.il and Mr. Rafi Grosglik, rafig@post.bgu.ac.il. Members of the academic committee include Prof. Yoram Meital, , Prof. Pnina Motzafi-Haller, Dr. Julia Lerner and Dr. Uri Shwed. Attendance at the conference is free and the lectures are open to the public. Pending budget approval, the organizers will provide all speakers with free university accommodation and half board. The program includes study tours in Beer Sheva and the Negev Desert. Please send abstracts of up to 250 words to desertfood2013@gmail.com by MAY 15 2013.